Step 1 Place quinoa in a fine-mesh sieve; rinse thoroughly under cool water. Warm 1/2 tablespoon oil in a saucepan over medium-high heat. Add quinoa and cook, stirring, until water has evaporated and quinoa begins to toast, about 1 minute. Add 1 cup water, a few pinches of salt, and a pinch of pepper. Bring to a boil, then cover, reduce heat to low, and cook for 15 minutes. Gently tilt pan to make sure water has absorbed (if not, cover again and cook for 2 minutes longer). Remove from heat and let stand, covered, for 5 minutes. Fluff quinoa with a fork. Step 2 Warm remaining 1 tablespoon oil in a medium skillet over medium heat. Crack eggs into skillet; season lightly with salt and pepper. Cover pan and cook until whites are set and yolks have reached desired doneness, 5 to 6 minutes. Step 3 Place 1/2 cup cooked quinoa in each of 2 bowls. (Cover and refrigerate remaining quinoa for another use.) Divide salsa, radish, and avocado between bowls. Top each with 1 egg, sprinkle with cheese, season with additional pepper, and serve. If you’re a fan of huevos rancheros, you’re going to love this healthy spin on the classic Mexican favorite. Quinoa is a grain-like plant product containing all nine essential amino acids; a cooked cup has five grams of fiber as well. 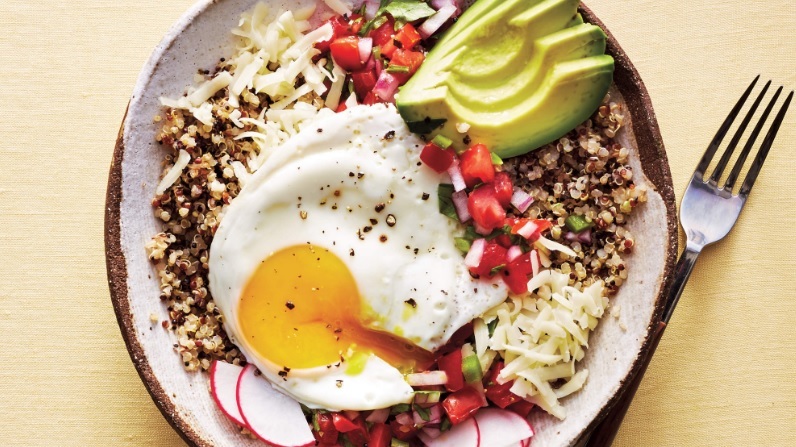 Packed with iron, magnesium and antioxidants, our quinoa ranchero bowl is a belly-filling low-calorie dish to try for breakfast, lunch, or dinner. It’s gluten-free and satisfies your Mexican food cravings, but without all the extra calories.